In this article, we’ll show you an easy method of tracking SaaS actionable metrics. These actionable metrics help you to better understand your customers in order to better build and market your product. The information gathered from AARRR tracking helps you to make better business decisions that can fuel growth for your SaaS business. Below I'll break down each of the actionable metrics with examples. For an easier way to understand them I will apply and example metric used by Hotjar. If you don't know Hotjar, they provide many features to better understand your users, such as heat maps, surveys, polls etc. They started primarily as a heat map tool, so I will concentrate on this feature for our example. Additionally I'll supply a free template to work from as you go through each metric. 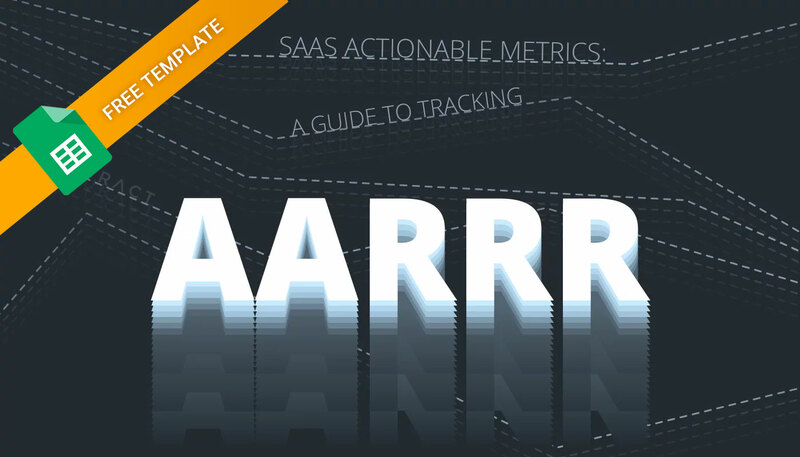 Download the free SaaS Actionable Metrics template here. How do users find you? - The first step where visitors sign up on your website for your software to begin exploring. When it comes to SaaS, sign up usually starts with a free trial, free sign up or some type of demo that allows the customer to experience a full or limited version of what your business has to offer. Do users have a great first experience? - They are now using your product and we want to make sure we help them quickly understand the value of the software. Ever heard of the 'aha moment' or time-to-first-value (TTFV)? This is where it comes in, and it's one of the most important things to get right. You can have the best messaging and trial sign up conversion rates but without proper activation you will never succeed. You have a short period of time to show your new potential customer value, otherwise they don't upgrade, you never get paid and you potentially lose them forever. So let's look at what you need to track to get this right. Do users come back? - Users are coming back to your tool and logging in, they are considering buying the product. Without solid retention you end up with a churn problem, the silent killer of SaaS businesses. One of the main goals for a healthy SaaS company is to not only show that initial value, but continue to deliver value. Make sure your customer success team is engaged and executing your CS strategy. Additionally, one of our parters, InnerTrends, has another great point. They say your customers need to have a dialogue with your product. If they are logging in to simply view something (ie a dashboard) and then logging back out, they are having a monologue. You need to think of ways to get them further engaged. Here is what to track in order to start getting retention right. Do users tell others? - Users are loving your product and start sharing it with their network of friends, colleagues and co-workers. Referrals aren't difficult to track but they may be the hardest metric to grow. Many businesses don't even consider referrals because they are so focused on acquisition. However, if you can apply an effective referral strategy you can potentially put acquisition on auto-drive. How do you make money? - Users subscribe to your tool and become customers. Without revenue you simply don't have a business. This is the most common metric that everyone tracks but not always the easiest to grow. Either way we can't forget revenue, but be prepared to kickoff customer success efforts as soon as that payment comes through. From here you will need to actually implement tracking and begin to make decisions off of your insights. If you need a tool to help with this we highly recommend our partner at InnerTrends. And if you need help putting this all into motion feel free to reach out to us and we would be happy to discuss taking care of this for you.